This region had also undertaken fundraising activities, and so was able to allocate funds for its own projects. $1 million has been allocated for the construction of forty homes in the Akhourian region which have already been provided for residents. The ARS of North America is also in the United Armenian Fund, for which it has spent $131,000 for shipping materials. The ARS-NA received a grant of $799,000 from USAID for the Nurse and Physician training program which, along with the $397,000 provided by the ARS-NA, yields a total of $1,196,000 for the project. At the time of the earthquake, the Canadian ARS was still part of the ARS of North America. Chapters in the Canadian region actively participated in community fundraising efforts, resulting in the collection of $2 million (CAN). Ten dialysis machines, one mobile medical unit, six-plane loads of medical supplies and equipment (worth $236,000 CAN) were sent to Armenia. Also, $37,300 worth of food, $35,141 worth of generators and building materials, $49,164 worth of tents and winter clothing and a laser printer, were sent to Armenia. In the Winter of 1990, $60,000 worth of powdered milk was sent to Armenia. The ARS of South America was able to obtain a donation of 10,000 kilos of meat (worth $15,000) and raised $5,000 at a special presentation by the ARS Nairi Dance Group. Australia-Armenian fundraising efforts were conducted at the community level, in which chapter participated. $106,000 (AUS) was raised for the Relief Fund. 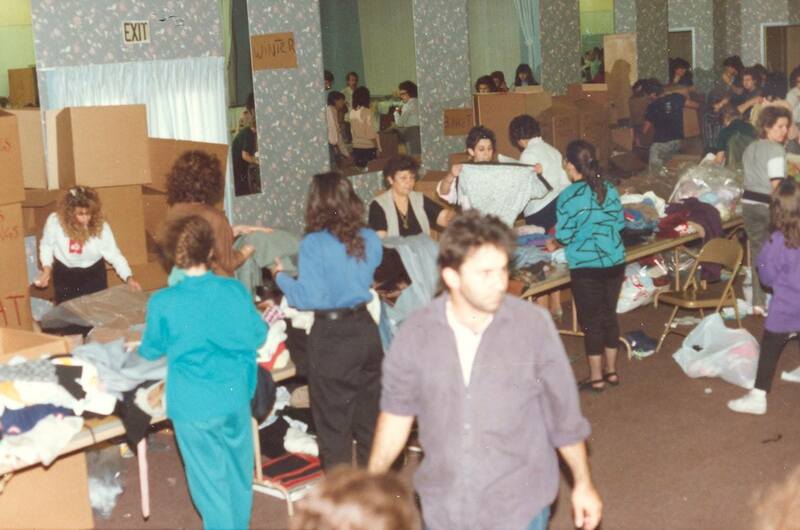 From 1989-1991, the ARS of Australia sent 30 tons of clothing to Armenia, as well as a neuro-muscular stimulator (Worth 750,000 AUS).